Legumes are edible seeds, enclosed in pods. 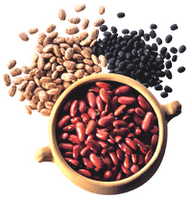 The word 'legume' stems from the Latin word Leguminosae. This plant family includes beans, peas and peanuts and that is why they are also known as legumes. I am not really a bean person. There are a few varieties of beans which I don't mind eating, or rather, I will abide. I suppose it is the way they are prepared. I love chili and bean soup, but don't like the taste of them when they are served as vegetables. A 1/2 cup portion of cooked beans (approximately 60-90g) contains about 20-135 calories, depending on the variety. Beans are naturally low in fat and high in fiber, protein, folate, and antioxidants. No wonder, eating two to four cups of beans a week cuts your diabetes and cancer risk. Research suggests, that substituting vegetable protein sources like beans for animal protein may significantly reduce your risk of dying from heart disease. Red kidney beans provide nearly 60% of daily folate needs and could also help protect heart health, guard against certain colorectal cancers. Just one cup of Navy or Great Northern beans provides half your fiber needs for the day, needed to help control cholesterol levels. Also, the Great Northern variety is the top bean source of phosphorus, a mineral needed for healthy bones and teeth. That's especially important for girls (ages 9-18), 40% of whom do not get adequate phosphorus. With so many varieties to choose from - pinto, black, garbanzo, navy, kidney and white - beans should be a regular part of your healthy diet. If you have a recipe with beans, besides the recommendation of adding bacon, I would love to hear it. It may help me to look forward to eating more of these little health boosters, although I have my doubts. Then again, you never know and it may blow me away. Grin.